I can’t explain why , but I love Gucci’s green and red stripes, along with all the status that goes behind the name. I don’t consider myself a label whore and try to avoid advertising a company’s brand , but somehow Gucci slipped thru the cracks with my fashion ethic code. The Gucci History is fascinating, so many family squabbles, greed, disloyalty , betrayal and death, it is no wonder the brand came crashing down and almost became obsolete. It wasn’t until someone brought in a pair of Gucci Loafers to my consignment store Timeless, in Palo Alto California that I even recognized or cared about Gucci. I looked at these shoes and it was love at first sight. 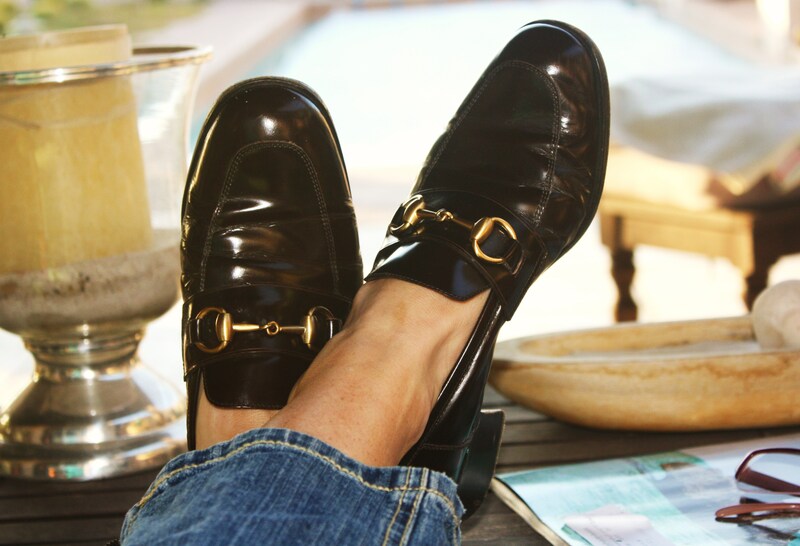 The loafers were so solid, the brown leather shiny and rich, along with the iconic horse bit to top it off. It was 1994 and no one seemed to care about Gucci anymore. Gucci had lost its status as a giant from the 1960’s. Not only were loafers being brought into my store but also Gucci bags, belts, and scarves that women just wanted to dump . I saw the value in these items and bought them to of course “save them” The Gucci loafer is the only shoe displayed in the New York Modern Museum of Art to this day. It was in 1995 that Tom Ford became the creative director of Gucci and resurrected the brand from going bankrupt to a 4.5 billion dollar empire all around the world. I remember watching the Grammy’s and seeing Madonna present an award in a fitted navy silk blouse , navy velvet pants and satin navy pointyheels. Wow!!!!!!!!! That’s “Gucci”. As my desire to own more Gucci prevailed, on a trip to Italy in 2003 an opportunity arose to buy some Gucci on the street literally and to buy fast, as the merchant would be moving his loot in about 5 minutes before the polizia came to bust up the illegal selling of fake merchandise. I couldn’t resist and bought two Gucci bags, a belt and a Hat all for $85.00. It was an adrenaline rush. I brought home the loot, and it sat around until one day when I looked at those green and red stripes on the belt, took a look at my old Reef flip flops and decided to perform surgery to give the flip flops a Gucci lift. 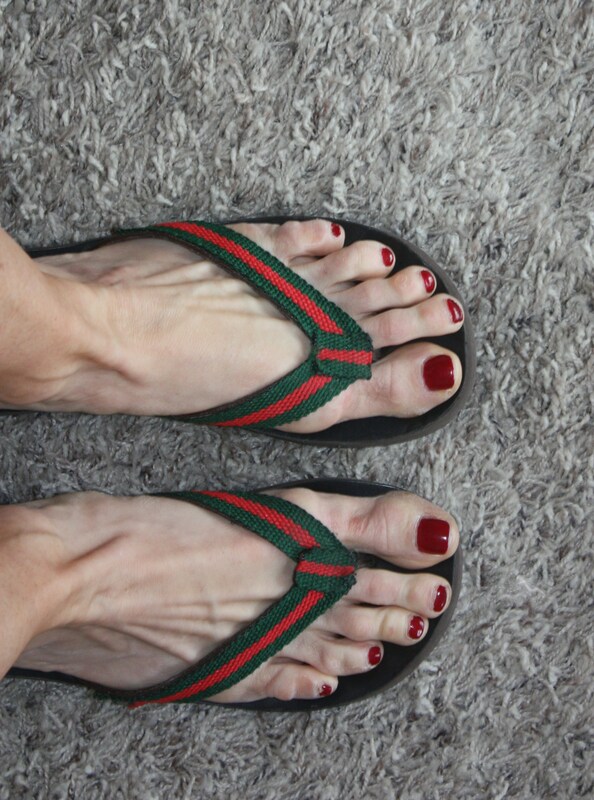 I carefully sewed on the “stripes “and before my eyes I now was the proud owner of “Gucci flip flops that retail for $250.00 I save these flip flops for special occasions- smart outfits, clean lines so that the stripes always stand out. Never compete with Gucci! Last year, Steve and I traveled to New York for the Holiday Season. The Holiday Windows are breathtaking, eye candy everywhere- on the streets, in the restaurants I could go on and on we all know New York City is a sensory overload and I love every minute of being overloaded”! We trekked to Soho one day and after having a fabulous lunch at Grammercy Tavern we ventured to Buffalo Exchange to see what kind of trouble we could get into. I always shop shoes first and to my delight their they were waiting for me . Gucci Kitten Heel Mules for $40.00! I also scooped up a Jil Sander top, Italian Riding Boots oh and some Manolos. SCORE!! Feeling creative one day I thought I would give this a try. It worked and I liked it. Displaying things, objects, rearranging furniture in a pleasing manner, and plating your breakfast , lunch , and dinner in a beautiful way have always been of interest to me and I find it very enjoyable. I add this quote made by the President of France Sarkozy in tribute to Yves Saint Laurent after he died ” Yves was convinced that beauty was a necessary luxury for all men and women” I feel the same way! Maybe because I am a Libra– who knows but I want to see, feel and experience beauty all around me– it is essential.